Software Architecture for Big Data and the Cloud is designed to be a single resource that brings together research on how software architectures can solve the challenges imposed by building big data software systems. The challenges of big data on the software architecture can relate to scale, security, integrity, performance, concurrency, parallelism, and dependability, amongst others. Big data handling requires rethinking architectural solutions to meet functional and non-functional requirements related to volume, variety and velocity. 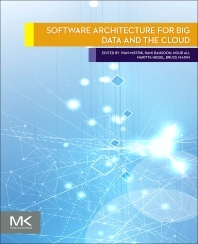 The book's editors have varied and complementary backgrounds in requirements and architecture, specifically in software architectures for cloud and big data, as well as expertise in software engineering for cloud and big data. This book brings together work across different disciplines in software engineering, including work expanded from conference tracks and workshops led by the editors. Rami Bahsoon is a Senior lecturer in Software Engineering and founder of the Software Engineering for/in the Cloud interest groups at the School of Computer Science, University of Birmingham, UK. His group currently comprises nine PhD students working in areas related to cloud software engineering and architectures. The group’s research aims at developing architecture and frameworks to support and reason about the development and evolution of dependable ultra-large complex and data-intensive software systems, where the investigations span cloud computing architectures and their economics. Bahsoon had founded and co-organized the International Software Engineering Workshop series on Software Architectures and Mobility held in conjunction with ICSE and the IEEE International Software Engineering IN/FOR the Cloud workshop in conjunction with IEEE Services. He was the lead editor of two journal special issues with the Journal of Systems and Software Elsevier– one on the Future of Software Engineering for/In the Cloud and another on Architecture and Mobility. Bahsoon has co-edited a book on Economics-driven Software Architecture, to be published by Elsevier in 2014 and co-edited another book on Aligning Enterprise, System, and Software Architectures, published by IGI Global in 2012. He is currently acting as the workshop chair for IEEE Services 2014, the Doctoral Symposium chair of IEEE/ACM Utility and Cloud Computing Conference (UCC 2014) and the track chair for Utility Computing of HPCC 2014. He holds a PhD in Software Engineering from University College London (UCL) for his research on evaluating software architecture stability using real options. He has also read for MBA-level certificates with London Business School. Maritta Heisel is a full professor for software engineering at the University Duisburg-Essen, Germany, since 2004. Her research interests include the development of dependable software, pattern- and component-based software development, requirements engineering (including quality requirements), software architecture, and software evolution. She is particularly interested in incorporating security and privacy considerations into software development processes and in integrating the development of safe and secure software. She has published over 100 scientific papers in various fields of software engineering. Bruce R. Maxim has worked as a software engineer, project manager, professor, author, and consultant for more than thirty years. His research interests include software engineering, human computer interaction, game design, social media, artificial intelligence, and computer science education. Bruce Maxim is associate professor of computer and information science at the University of Michigan—Dearborn. He established the GAME Lab in the College of Engineering and Computer Science. He has published more than fifty papers on computer algorithm animation, game development, and engineering education. He is co-author of Software Engineering: A Practitioner's Approach, a leading software engineering textbook.